You may recall my August 22 post which reported that Karl Meltzer's bid for the fastest completion of the Appalachian Trail was in jeopardy. Originally, Meltzer intented to set the speed record on the Appalachian Trail by completing the entire length of the 2,174 long trail in just 47 days. However, problems arose for the ultra marathon runner early on when he was forced to trek through several days of rain in Maine that resulted in a nasty case of trench foot. He also contracted poison ivy on the toes of his left foot, forcing him to over-compensate on the other foot, which ultimately resulted in tendonitis. All of this forced him off the trail for three days in-a-row. After a few early set-backs, it was clear that Meltzer wasn't going to break the record. However, he decided he was going to complete the trail anyway, citing that he would use the learnings from this trek for a future assault on the record. Meltzer pressed on by doing 40 and 50 mile days. Yesterday, he knocked-out an inhuman 71 miles! Then, early this morning, with a celebratory beer in hand, Meltzer finally reached the summit of Springer Mountain, the southern terminus of the Appalachian Trail. Officially, it took him 54 days, 21 hours and 12 minutes to complete the entire trail, making it the fourth fastest completion of the Appalachian Trail ever. It's time to let your voice be heard. It's time to tell the world what your favorite national park is or which state is the best state for backpackers to live in. Backpacker Magazine is currently sponsering its annual Reader's Choice Survey. This is your chance to vote for your favorite mountain, your favorite long trail or that piece of camping gear that you just can't leave behind. This is a fairly comprehensive survey that also asks questions such as: Which is the worst way to die in the backcountry? or, what is the worst all-time adventure movie? Results of the survey will be published in the February issue of the magazine. A few weeks ago I posted a blog with regards to when and where to hike in Great Smoky Mountains National Park in order to fully enjoy the fall colors as the season progresses. At the end of the article I made a few suggestions on how to track the color changes in the park. I mentioned following the fall foliage map on the Weather Channel website. I also mentioned that you could get a birds-eye view on changes in fall colors by periodically checking the four Smoky Mountain web cams on my new and improved weather page. Since publishing that article I came across another web page that might be helpful in tracking the progression of fall colors throughout the southern Appalachians. Here’s a link. If you’re looking for suggestions on when and where to hike in the Smoky Mountains, I’ll refer you back to the aforementioned article by clicking here. The elk mating season, better known as the rut, has arrived in Great Smoky Mountains National Park. This means that the best time to view elk in the park is between now and the next couple of weeks. The best places to see elk in the Smoky Mountains are in the Cataloochee Valley and near the Oconaluftee Visitor Center, and the best times for viewing are early in the morning and just before sunset. The elk rut is characterized by the loud bugling noise made by adult males. The typical bugle call of a male bull elk is a distinctive sound that begins deep and resonant, and becomes a high pitched squeal before ending in a succession of grunts. Elk males use a combination of bugling and aggressive behavior in an attempt to establish dominance over other males in order to attract females. With hormones raging during this time period, gigantic battles among competing males are common. If you plan on viewing this incredible spectacle, be sure to bring binoculars. Also, stay a safe distance away from all elk, as males are extremely aggressive and unpredictable. This is a key time period for elk in the Smoky Mountains. The introduction of the elk back in 2001 is still considered to be an experiment, which will be expiring later this year. At that time, the University of Tennessee will provide the park with research information to help determine whether the experiment failed or succeeded. Ultimately, this will decide whether the elk stay or go. Please click here for information. Below is an excellent 2 minute video highlighting the typical behavior of elk during the rut, including the distinctive bugle call. This footage was taken in Rocky Mountain National Park in 2006. Have you ever meet any interesting characters while out on the trail? Do you have any good stories about an encounter with a strange or unusual hiker? I’d love to hear about them. I have three stories I’d like to share: one was a bit unsettling at the time, one that was truly absurd, and the other a unique and interesting one. Back in the mid-Eighties I did a short evening hike with a small group to one of the overlooks in Red River Gorge in central Kentucky. Just before reaching the Chimney Rock overlook, an extended Vietnamese family passed us heading back towards the trailhead. We exchanged greetings, thought they looked like nice enough people, and didn’t think anything more about it. Roughly fifteen minutes later we began hearing some shouting from at least two different locations in the valley below us. Although we couldn’t understand what was being said, it didn’t sound particularly friendly. Another thirty minutes or so passed before we decided to head back up the trail before it got too dark. We hadn’t walked too far when three guys, dressed in full battle fatigues, with war-painted faces and large hunting knives sticking out of their belts, approached us from the opposite direction. Red River Gorge is in the Daniel Boone National Forest where hunting isn’t allowed. So, obviously, these guys weren’t hunters. Needless to say we were a little taken aback as they approached us. They proceeded to ask us if we had seen any “gooks”, which was a common disparaging term used to describe North Vietnamese soldiers during the Vietnam War. We immediately knew who they were looking for. Although we had just passed the Vietnamese family less than an hour before, we played dumb and told them we hadn’t seen anybody. To this day we have no idea what was going on that evening in the Gorge, but I can say with certainty that it didn’t appear to be a good situation. My absurd hiking story occurred in the Grand Tetons a few years ago. We were hiking the Cascade Canyon Trail when we came upon a large group of people making a great deal of noise. The “leader” of this group, a muscular guy without a shirt and wearing a bandana, whom we appropriately nicknamed “Rambo”, was banging the ground with an extra-large stick. He and his group of about ten were all yelling at a young black bear walking just in front them along the trail. Recognizing their accents, we assumed they were tourists from Germany. The absurd part of this story is that the bear didn’t care how loud these people yelled. He continued strolling down the trail at his own leisurely pace. With the Germans leading the way, we literally followed the bear for at least a mile before the bear decided he had had enough and meandered off into the woods. My final story occurred on the Dream Lake Trail in Rocky Mountain National Park. About a mile into the hike we came across a group of about 30 Buddhist monks from Vietnam, all dressed in traditional clothes. They were taking part in a Buddhist monk convention in Estes Park and decided they wanted to do a little hiking in the mountains. We spoke with a couple of them and even had a picture taken with one of them. They were all very friendly. It was one of the most unique and memorable hikes that I’ve ever been on. What about you? 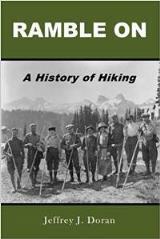 Do you have any interesting, bizarre, or unique hiking stories? Over the last 100 years there have been 64 confirmed sightings of mountain lions in the eastern United States (outside of Florida), according to Mark McCollough, a Fish and Wildlife Service biologist. One of those was a cougar kitten that was hit by a truck in Kentucky in 1997. Wildlife experts think most of these “ghost cats” were either escaped pets or migrants from the west. Native populations have never been confirmed. However, for the last several years, residents of Blackstone, Virginia have reported several cougar sightings around town and in the neighboring 41,000-acre Army National Guard training base. There have been at least 15 sightings since 2003, even though mountain lions have officially been considered extirpated from the East since 1900 (excluding Florida, which has an isolated subspecies population of about 100). Despite a few recent unconfirmed reports, the All Taxa Biodiversity Inventory study in the Smoky Mountains has yet to find any evidence of the big cat in the park. Hundreds of motion-activated cameras dot the Smoky Mountains, 600 miles of the Appalachian Trail, and other forested areas throughout the East. There have been hundreds of photos of bears, deer and other critters, but no cougars. Despite all the naysayers, the town of Blackstone is out to prove the existence of the elusive cat. The town has set up a handful of cameras in the surrounding area with the hope of getting proof. Blackstone animal control officials and volunteers also plan to contribute by setting up patrols and other methods of detection. Whether proof is found or not, it’s unlikely the results will calm the nerves of some of the residents in this small eastern Virginia town. Looking for some hiking partners? There’s a relatively new hiking group that “meets up” for hikes in Great Smoky Mountains National Park as well as the state parks and national forests in the surrounding area. The Great Smoky's Hiking Meetup Group isn’t a traditional hiking club. It’s actually part of Meetup, which is the world's largest network of local groups. The Meetup website makes it easy for anyone to organize a local group or find one of the thousands already meeting up face-to-face. The Great Smoky's Hiking Meetup Group is based out of Maryville and Knoxville, but has some members from as far away as Florida. The group is an open venue where any member can suggest a hike, whether it be an easy or a strenuous hike. They have two or three 'Hike and Camp ' weekend events every year in one of the park campgrounds. They also do backcountry camping, bike rides, river rafting and even sponsor a cookout every now and then. Although membership is free, the group does appreciate donations to help pay administration costs. Below is an excellent video showing a short history of the Elkmont community in Great Smoky Mountains National Park. The community dates back to the early 1900s when the cottages were used as summer homes by the affluent from Knoxville. The video gives a brief history on the establishment of the community as well as the subsequent decline after the National Park Service began purchasing the buildings and land in its efforts to create the park. The video also provides a rare look inside of a couple of the structures which have been off-limits to the public. The video was posted just over a year ago and shows the dilapidated condition of the community. However, since then, the Elkmont community has begun the process of undergoing some major changes. Facing pressure from historic preservation groups, the park has reversed its policy of allowing the structures to deteriorate and has recently begun emergency stabilization projects on 18 homes, as well as the Appalachian Clubhouse. Eventually the Park Service hopes to restore all 19 structures so they can be viewed by the public. Furthermore, the Appalachian Clubhouse will become a public day use area with educational exhibits. At this point, the park plans on removing the other 55 buildings and returning their sites to natural habitats. The Elkmont area is located near the Little River Trail and Cucumber Gap trailheads just outside of Gatlinburg. At least that’s what the folks over at Bushnell are telling us. They’ve recently introduced a new GPS device called the Bushnell BackTrack. 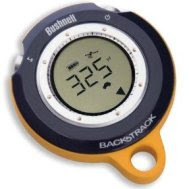 Instead of all the bells and whistles you find on other GPS units, the Bushnell BackTrack takes a minimalist approach. No color touch screens, mapping software, or virtual games to deal with. The genius of the BackTrack is in its simplicity and ease of use. The product basically has two functions. Primarily, the BackTrack is a personal location finder. It also has a self calibrating digital compass. You can use the BackTrack to get back to the trailhead or back to your car. Simply mark your location before heading out, and BackTrack will help you get back to the trailhead, your campsite, or even back to your car at the mall or the stadium parking lot. 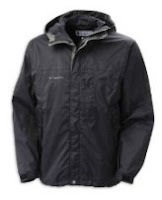 The BackTrack uses a high sensitivity SiRF Star III GPS receiver and is weather resistant. 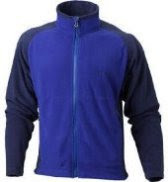 Its compact size also makes it easy store in your pocket or attach to a lanyard. 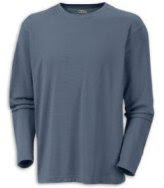 If you would like to see more product information, please click here. I just received my copy of the fall issue of the Smokies Guide in the mail yesterday. One of the lead stories was a report on the elk population in the park. The article stated that the elk population has grown to 95, and the animals have spread from the Cataloochee Valley. There are now reports of individuals or groups of elk in Oconaluftee, Cosby, Balsam Mountain, White Oak, the Cherokee Indian Reservation and up on the Blue Ridge Parkway. Elk were reintroduced to the park in February of 2001. Originally, 25 were transplanted to the Cataloochee Valley from the Land Between the Lakes National Recreation Area along the Tennessee-Kentucky border. Another 27 were added in 2002 from Elk Island National Park in Alberta, Canada. The program was originally set-up as a five year experiment to ensure that elk could survive in the area on their own. Because the elk population failed to grow during the original five-year period, the experiment was extended another three years. Researchers didn’t have enough data on elk movements, mortality and human interaction to support a long-term decision at that point. The extended experiment will expire later this year. At that time, the University of Tennessee will provide the park with research information to help determine whether the experiment failed or succeeded. Ultimately, this will decide whether the elk stay or go. However, at a public meeting earlier in the year, Great Smoky Mountain National Park Wildlife Manager Joe Yarkovich said "I will say unofficially that it's a success. We're looking pretty good. We've finally got the number of animals we wanted. We’ve got a ton of public support. Calves are hitting the ground and surviving. We're in pretty good shape for the future." Keeping elk in the park is important on many levels. Not only are they a draw for visitors, but they help to complete the natural ecosystem in the Smoky Mountains. There was one other piece of news that I thought was pretty interesting. Over the next couple of years, the Cades Cove Loop Road will be repaved. The article didn’t give a specific timeframe, but this is great news. This will make bicycling on road bikes much more enjoyable. There are a handful of special programs coming up in the Smoky Mountains that hikers might be interested in. Over the next several weeks the park will be sponsoring several scheduled hikes which will be guided by park rangers. All hikes are free to the public. On September 15, and then again on October 14, there will be a Full Moon Hike in Cades Cove. Both hikes begin at 7:00 p.m. from the Orientation Shelter at the beginning of the Cades Cove Loop Road. As part of the 75th anniversary celebration of the Civilian Conservation Corps (CCC) this year, in which the park is honoring the achievements of the CCC, there will be two ranger lead hikes. On Friday, September 26, there will be a hike up the Kephart Prong Trail. This hike begins at 10:00 a.m. The next day, on September 27, there will be a hike along the Old Sugarlands Trail. This hike will begin at 1:00 p.m.
On Saturday, October 4, there will be hike into the Little Cataloochee Valley to discover the rich history of the area. This hike begins at 10:00 a.m. The Nature Conservancy Magazine is seeking photos to feature in their quarterly magazine. Each publication will highlight a particular subject with the first one being National Parks. The magazine's editors will pick their favorites each quarter and feature the photos in the magazine and in an online slideshow at www.nature.org/magazine/. The magazine is looking for beautiful nature pictures representing the diversity of life on Earth, including forests, grasslands, lakes, rivers, deserts, rainforests, oceans and coral reefs. The deadline for the National Park pictures for the winter issue is September. 11. Looking for a great online resource to help plan your vacation or road trip to Great Smoky Mountains National Park? 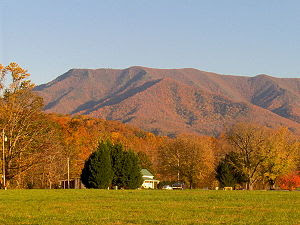 Take a look at the MySmokyMountainVacation website. The website, online since 1996, provides a wealth of information for planning your trip. The site has a nice index for finding cabins, hotels, bed and breakfast inn’s, condos and campgrounds for each of the gateway communities on the Tennessee side of the Smokies. You can even find links to last minute specials on cabins, pet friendly cabins or cabins specifically for groups. The site also includes an exhaustive list of suggestions on places to see, things to do, scenic drives, festivals, details on wildlife in the park, information on historic buildings, information on weddings in the park, as well as park rules and regulations. I especially liked the page called “101 reasons to visit the Smokies”. You can find information on anything to do from elk viewing, whitewater rafting, hot air balloon rides, llama trekking, to carriage and hayrides. The website will also send you all the visitor information you need to help plan your trip. The final phase of repaving on the Gatlinburg Spur (U.S. 441) will begin this Monday. From Monday, September 15 through Wednesday, October 8 motorists can expect single lane closures anytime from Monday mornings through noon on Friday. The 4.5-mile-long Spur runs between Gatlinburg and Pigeon Forge. There are two lanes running in each direction. A final layer of high-performance pavement will be applied to enhance friction/skid resistance, thus, providing for a safer road surface during inclement weather. The work also includes rumble strips in the shoulder of the road which alerts drivers when they are drifting off the roadway. For all those climbers and adventurers out there, or for people who just enjoy watching extreme sport films, the 3rd annual Reel Rock Tour is coming to a town near you. The Reel Rock Tour is a climbing and adventure film festival, which will be touring in over 80 cities around the world. The tour kicks off tomorrow in Boulder, Colorado. Then, throughout September and October, the film festival tour will bring the latest and greatest in climbing flicks to practically every state in the nation. You should be able to find a town within driving distance. The tour will make stops in Nashville on 9/11 and in Asheville on 9/18. You can visit the Reel Rock Tour website for all tour dates. Have you noticed the rash of encounters and aggressive bear activity over the last several weeks in the Smoky Mountains? First there was the much publicized attack on the eight-year-old Florida boy back on August 11. If you remember, his dad was forced to fight the bear off twice before the bear relented. Just four days later, Appalachian Trail ridge runner Jim Mowbray was bluff-charged by an adult female at the Russell Field Shelter. That same night, a bear spent the night tearing a hole in the metal roof of the Mount Collins trail shelter and terrorizing the ten backpackers inside. The bear tried to peel the metal roof back like a tin can, continuing even as the occupants jabbed it with their hiking sticks. The park service was forced to close both shelters. There are stories of other encounters from the blogosphere. Smoky Scout has a report on her blog about an encounter she had with a mother and two cubs on the Sugerland Mountain Trail. Chris over at Your Smokies has had two recent encounters. Around the same time as the attack on the Florida boy, he was stalked by a bear on the Lead Cove Trail. Then just last week, he saw several bears on the Cold Spring and Hazel Creek Trails. If you haven’t seen the National Park web site recently, there’s a laundry list of trails and campsites that have bear activity warnings. They include: Gabes Mountain Trail, Laurel Falls Trail, Little River Trail, Rabbit Creek Trail, Ramsey Cascades Trail, and the West Prong Trail. In addition to these trails, the Icewater Spring Shelter, the Tricorner Knob Shelter and backcountry campsites 5, 6, 12, 16, 18, 31, 50, 52 and 113 all have warnings as well. Backcountry campsites 10, 15, 24, 26, 29, 53, 113, and, as mentioned above, the Mount Collins and Russell Field Shelters are all closed due to aggressive bear activity. The first thing you should do is learn and understand bear behavior. As much as possible, you should try to avoid bear encounters. Finally, and most importantly, know what to do if you come across a bear while hiking. A good place to begin learning about bear behavior and knowing what to do if you see one on the trail is by checking out the black bear page on the National Park website. There’s also a pretty good video (although somewhat comical) on the Backpacker Magazine website that shows how to handle bear encounters on the trail. Black bear populations are on the rise in the park. This can only mean that human-bear encounters will also increase. Be prepared. Do what you can to avoid encounters and know what to do if you do meet a bear on the trail. If it makes you feel at ease, carry bear deterrent spray with you. But again, know how and when to use it. I purchased my Garmin GPSMAP 60CSx GPS unit several months ago specifically for the HikingintheSmokys.com project. 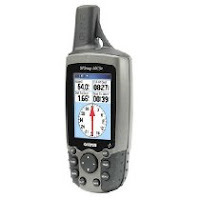 There are a ton of bells and whistles on this product, including an odometer, altimeter, electronic compass, mapping, geocaching, various outdoor calendars, and many other options, statistics and functions. I use the Garmin extensively for all the mileage and elevation figures on my web site. This product review will focus on the functions I primarily use. As you might guess, I need accurate mileage data for the trails on my website. The odometer on this product provides me with that accuracy. I have tested the Garmin GPSMAP 60CSx against known distances and have found it to be nearly exact, if not exact, in its distance measurements. People intimately familiar with Great Smoky Mountains National Park might notice a few instances where my reported mileage figures are slightly different than what the Park has listed on their maps. I believe the Garmin to be more accurate. I spoke with a backcountry park ranger in Glacier National Park a couple years ago and he scoffed at the "officially" reported mileage figures for the trails in that park. He claimed that he didn't trust any of those figures because of the way they were calculated. My other primary use with the Garmin GPSMAP 60CSx is with its altimeter function. I've seen elevation measurements on this unit fluctuate by as much 20 or 30 feet for the same location from one measurement to another. The reason for this is because it uses barometric pressure to calculate elevation. That measurement will fluctuate when there's movement in barometric pressure, such as when a front or a storm passes through the area. Additionally, elevation figures on the unit have always been within 20 or 30 feet of known elevations within the Smoky Mountains. I’ve only had one issue with obtaining a reasonable elevation figure. This occurred at the Alum Cave trailhead where I noticed that I was off by more than 500 feet when compared to the known elevation of this location. However, once I got to the top of Mount LeConte, the problem was corrected and there was only a 10 foot difference compared to the known elevation at the summit. This anomaly is easy to explain though. A very strong and powerful storm swept through the Smokies just hours before our hike that morning. I returned to the same trailhead on three additional occasions and the Garmin reported elevations that were very close to the official elevation for the trailhead. Despite the small fluctuations, elevation measurements are reasonably accurate. This particular Garmin model allows me to link the unit directly to my computer so that I can download elevation data from each of my hikes. Elevation is recorded every few yards by the unit, and is saved to what Garmin calls a “track”. I then load the tracks into Microsoft Excel and create the elevation profile graphs that you see on each of my trail pages. This product seems to locate satellites fairly quickly, usually taking only about a minute or two to find one. In all the different terrains and in the deepest old-growth forests of the Smokies, I have never had a problem acquiring or keeping a satellite, except on one occasion. This happened to be at the Alum Cave trailhead on the same day as previously mentioned above. On that day, it took several minutes before I was able to finally locate a satellite. Again, I chalk this anomaly up to the storm. As I mentioned above, the GPSMAP 60CSx has many bells and whistles. I found that the unit interface makes it very easy to navigate through each of functions. Additionally, I thought it was fairly easy to learn how to use and to set-up most of the options as well. All in all, I really like this product and would recommend it to anyone. If you would like to see more in-depth product information, please click here. Some people will walk 5 or 10 miles, or maybe do a 50 or 100 mile bike ride in order to raise money for a certain cause. Sharon McCarthy, also known as Smoky Scout, has taken it upon herself to do something slightly more ambitious. She’s currently in the process of hiking all of the trails in the Smoky Mountains. In case you’re not familiar with the trail system in the Smokies, there are roughly 800 miles in the Park. Completing all 800 miles will require her to hike roughly 1000 miles! So why has she decided to hike every single mile of trails in the Smokies? Ultimately, her goal is to raise $20,000 to help support the Girl Scouts Hornets' Nest Council in North Carolina. HikingintheSmokys: How long have you been involved with the Girl Scouts? Smoky Scout: 3 years as a girl and 18 years as an adult volunteer. HITS: Why did you choose to set a goal of hiking all the trails in the Smokies to raise money for the Girl Scouts? What inspired you to undertake this quest? Smoky Scout: The hiking goal came first, somewhat selfishly, for four reasons: One, my mom passed away in January of 2007 after a brief but terrible fight with lung cancer and I began to think, as probably most people do, about what my life looked like and if there was anything I would not want to leave undone. Two, I was looking down the tracks as my 50th birthday approached. Three, my husband and I were about to become empty nesters. Hiking all of the trails in my lifetime had been an idea in the back of my head for a few years but it seemed like a giant puzzle on how to accomplish it. Then along came Four, Elizabeth Etnier’s Book, “Day Hiker’s Guide to All the Trails in the Smoky Mountains”. I realized that I now had a blueprint and that setting this goal would help me deal with Reasons 1 through 3. The fundraising portion came second. I knew that many people hike the AT for fundraising and there are many athletic events for charity, including bike rides, marathons, walks, etc. And the Girl Scouts is an amazing organization that I have been connected with for many years and I have seen the good work that they do. It is the premiere organization for the whole girl, not just one aspect or skill. I have seen many an ah-ha moment with girls in the outdoors and I want to see the opportunities expand. HITS: Are you the only person raising money for the Girl Scouts, Hornets'Nest Council, or are there other people involved in this effort? Smoky Scout: There are no other hikers soliciting donations for my project but there are other people keeping me company on the trails. Of course, Girl Scouts has other ways of fundraising, including family campaigns and – of course – cookies! But my project’s fundraising will go directly towards outdoor programming. HITS: So far, you’ve hiked 172 out of the roughly 800 miles in the park, and have raised $1113 out of your goal of raising $20,000. Are you happy with your progress? Smoky Scout: When I began to plan my hiking I knew that I would not do it in a consistently steady manner, i.e., an equal number of miles per month. My youngest child was getting ready to enter college in August and I knew I wanted to be around home as much as possible until then. So I planned most of my hiking for the fall and winter. As for the progress with the fundraising, I set an extremely ambitious goal to show girls that I think they are worth a lot! I expect that the donations will increase more rapidly as I get closer to my mileage goal. HITS: In what ways will the funds you raise help the Girl Scouts? Smoky Scout: Most of that will be determined when we see what the total amount is. We did not want to set our sights on a specific project (such as buildings at a summer camp) and have the funds possibly be too low to make it happen; conversely, we did not want to set our sights too low on a specific project (such as backpacking equipment) and have way more than that would require. My personal hope is to fund several different things, including summer camp scholarships for girls with financial needs, some hiking/camping weekends for older girls, and perhaps elements for a challenge ropes course, etc. HITS: Have you been a hiker your whole life? Smoky Scout: As a kid I played in the woods behind my house but I did not really experience hiking until I was in college at Virginia Tech, and then only to local waterfalls. Once I had a family we discovered the county and state parks as a way to spend family time. As an adult in Girl Scouts I learned to camp and cook outdoors and hike – and just kept going. HITS: Were you familiar with the Smokies prior to your quest, and have you spent a lot of time there? Smoky Scout: My husband and I have been going to the Smokies both with and without our kids for many years, camping and doing popular short hikes like Chimney Tops, Kephart Prong, Deep Creek, Charlies Bunion, and then stretching out some to Mt. LeConte and Shuckstack. HITS: Did you realize in doing this you will become a member of the select 900 Miler Club which is reserved only for people who hike all of the trails in the Smokies? HITS: So far, what is your overall favorite trail in the Smokies and why? Smoky Scout: So far – who doesn’t love Gregory Bald and Hemphill Bald? Both of those hikes were on beautiful clear days. HITS: What trail do you look most forward to hiking? Smoky Scout: I am looking forward with anticipation and anxiety to going over Thunderhead Mountain on the AT. HITS: Will you be doing a lot of backpacking or will you be doing mostly day hikes? Smoky Scout: Mostly dayhikes, but probably several backpack trips with some partners who are also completing their maps. HITS: How do you plan on tackling the AT? Smoky Scout: Not in one straight shot all the way through, but bit by bit combined with routes going up to and down from it. Ms. Etnier’s book is really an excellent method for tackling every trail in the Park including the AT. HITS: Have you had any close calls or have you run into any dangerous situations; such as with aggressive bears, wild boars, bad storms, an injury, etc..? Smoky Scout: People who read my blog will know about my “bear phobia” and I have met one mama bear who huffed and clacked her teeth quite a bit to get us backing up out of her jurisdiction. She had two cubs up a tree no more than 20 feet from the trail and we walked right up alongside of her before we noticed her. It put a fine point on how quickly you can come upon bears in the Smokies. HITS: Do you have any advice for someone considering tackling such a feat? Smoky Scout: Choose a reasonable time frame (a year is pretty tight!) and be flexible. If you choose a short time frame, think about winter road closings as you plan your hikes. Always be ready with a Plan B and Plan C because of weather, high water crossings, or just being too tired to do another 15 miles on Day 4. Join a local hiking group like the Carolina Mountain Club or Smoky Mountains Hiking Club. Talk to everyone about what you are doing and people will come from all over to help. I even have little “contact cards” like a business card that I sometimes give to people I meet in the Park. Hikers are a pretty terrific bunch of people and you will be surprised where your biggest supporters come from. The fall hiking season is rapidly approaching and soon leaf peepers will be out in full force in the Smoky Mountains. Although the Smokies has experienced an extreme drought this summer, Katherine Mathews, Western Carolina University's foliage forecaster, is predicting above-average leaf color this fall. Typically, drier weather during the spring and early summer results in a colorful fall leaf season, said Mathews. it virtually impossible to predict the exact dates of "peak" colors in advance. One of the most important variables is elevation. At the higher elevations in the Smoky Mountains, fall color displays begin as early as mid-September with yellow birch, American beech, mountain maple, hobblebush, and pin cherry beginning to show autumn colors. If you’re looking for good fall color hikes during this time period, you’ll want to be at the highest elevations in the park; however, you’ll also want to avoid hiking in areas that are predominantly spruce-fir forests. Suggested mid-late September hikes: Andrews Bald, Mt. LeConte, the Jump-off or Rocky Top. From early to mid-October, during most years, fall colors begin to reach their peak above elevations of 4,500 feet. Trees such as the American beech and yellow birch begin to turn bright yellow, while mountain ash, pin cherry and mountain maple show-off their brilliant shades of red. In the lower elevations you may notice a few dogwoods and maples that are just beginning to turn. You may also see a few scattered sourwood and sumac turning to bright reds as well. Suggested early-mid October hikes: You’ll still want to hike in the higher elevations. In addition to the suggestions above, check out Gregory Bald, Mt. Cammerer, Spence Field or the Sugerland Mountain Trail starting from Clingmans Dome Road. Autumn colors usually reach their peak at mid and lower elevations between mid-October and early November. This is usually the best time to be in the park as you will see the spectacular displays of color from sugar maples, scarlet oak, sweetgum, red maple, and hickories. Your hiking choices will have greatly expanded during this time period as well. You can continue to hike at elevation to take in the fall colors from above, or you can walk among the autumn colored trees. Suggested mid-late October hikes: If you wish to hike at elevation for spectacular fall views try exploring the Rich Mountain Loop, Alum Cave, Hemphill Bald, Shuckstack, Bullhead, Charlies Bunion or Mt. Sterling trails. If you wish to hike among the trees, check out Baskins Creek Falls, Little River, Old Settlers or the Porters Creek Trail. As the fall color season begins to wind down in early November, you’ll want to hike at the lowest elevations in the park. Check out Miegs Mountain Trail, Schoolhouse Gap, Abrams Falls, Oconaluftee River Trail, Indian Falls, or the Deep Creek Loop. To get a general idea of when leaves are approaching peak colors you can follow the fall foliage map on the Weather Channel site. To get a birds-eye view on changes in fall colors, you can periodically check the four Smoky Mountain web cams by clicking here. You would think being an Alaskan smokejumper would be adventurous enough. Not if you’re Bruce Nelson. Bruce personifies adventure. Just take a quick look at some of the highlights from his outdoor adventure resume. He’s hiked the 2168 mile Appalachian Trail, bicycled coast-to-coast across the southern United States, canoed 2300 miles down the length of the Mississippi River, and has climbed Mt. McKinley (also known as Denali). Additionally, in what he described as “one of the great adventures of my life”, he walked and paddled over 1,000 miles across Alaska in the summer of 2006. Did I mention he did this alone? Nelson lives the lifestyle. He recently retired from his smoke-jumping days, but he continues to live in his 16' X 20' cabin northeast of Fairbanks, Alaska. He has an oil-burning stove and has all the normal comforts of home with the exception of running water. 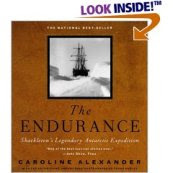 His trek across Alaska was no ordinary adventure. Traveling from east to west, Nelson crossed the isolated northern section of Alaska, which took him across the Arctic National Wildlife Refuge and the Brooks Mountain Range. There aren’t any trails or guide books to follow in this part of Alaska. Nelson essentially "winged it" by studying topographical maps. It took him 77 days to complete his trek. He estimates that he hiked 615 miles and canoed about 403 miles down the Noatak River to the Bering Straight. Here’s an excellent 3 minute trailer from his “Alone Across Alaska” DVD. Alone Across Alaska: 1,000 Miles of Wilderness from bucktrack.com on Vimeo. One of the most important things while hiking is staying properly hydrated. Hiking in any type of weather depletes your body of liquids. To replace those lost fluids you need to drink frequently. If you wait until you feel thirsty you’re more than likely already dehydrated. The more dehydrated you become, the less efficient your body is at cooling itself down. Your endurance decreases and your body becomes less efficient at walking as well. Dehydration can cause muscle cramps, headaches, fatigue, heat exhaustion, heat stroke and even acute mountain sickness. Obviously, dehydration is something you want to avoid. If you’re hiking for less than an hour under normal conditions, more than likely you’ll only need a standard water bottle for your hydration needs. If you’re hiking for more than an hour, or it’s very hot, or if there’s a lot of climbing involved, you have a couple of choices. You can carry multiple water bottles in your backpack, or you could use Nalgene Bottles, a Platypus, or a Camelbak hydration pack. Each option has its pros and cons. When I first started hiking, I used Nalgene Bottles to carry extra liquids. 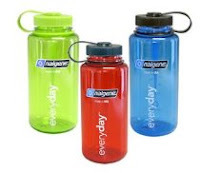 Nalgene Bottles are an extremely efficient way to store extra water for hiking. The wide mouth makes it easy to fill, as well as re-filling your drinking bottle. The wide mouth also makes it easy to add ice cubes to your drink. Nalgenes are also extremely durable. With the possible exception of the loop, which keeps the lid attached to the bottle, it would be very hard to break this product. One additional benefit of Nalgene Bottles is that they dry quickly after use. This is important because you don’t want to trap any liquids in your container while you’re storing it or it will get moldy and smell. My only complaint with Nalgenes is that they continue to occupy a lot of space in your pack after you’ve used the contents. This really isn’t a big deal, just a personal preference. Because of this, however, I made a switch several years ago to the Platypus. I especially liked this option because the container collapses as you consume your liquids. Once finished, the Platypus takes up virtually no room in your pack. 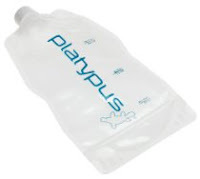 Although the Platypus is made with a flexible plastic, it’s still very tough. I have two Platypuses that I have stored folded and they still are working fine after several years of uasge. The Platypus can also be frozen or boiled. Furthermore, I have never had a problem with water tasting like plastic. There are two downsides to using the Platypus. Again, neither of these are big issues. One, it takes two or three days for the container to completely air dry before storing. The second thing to think about is that it takes two hands to pour your water from the Platypus into a water bottle. 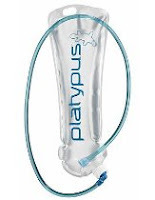 Interestingly, Platypus has recently introduced a “Hoser” system, which is very similar to the Camelbak hydration pack, a very popular choice among mountain bikers. The Hoser Hydration System allows hikers to stuff a Platypus in their pack, attach a hose, and create a hands free system. A bite valve allows you to drink without ever having to touch a water bottle. This is an excellent choice if you’ve had problems staying hydrated on hot days because you just don’t drink frequently enough. The final hydration option is the Camelbak. My wife uses her Camelbak from time to time. The Camelbak company provides you with the option of purchasing a reservoir and tube system that you can stuff in your pack, or a backpack with the Camelbak system already installed within the pack. My wife likes her Camelbak because it holds all the water she needs, and she finds it easier to drink, thus keeping her properly hydrated. Her biggest complaint is that sometimes the system has the taste of plastic. Also, on hot days, the water that sits in the hose tends to get hot if exposed to the sun. It can also be a challenge keeping the drinking valve clean while out on the trail. Finally, it can also be a challenge getting the reservoir dry after usage.